Which J.R.R. 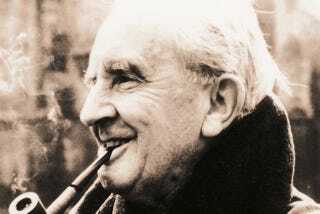 Tolkien Movie Will Be The Docudrama To Rule Them All? Not one but two movies are being made about the true Lord of the Rings, author J.R.R. Tolkien. Fox Searchlight announced one last year, expansively titled Tolkien; now a smaller independent company is making Tolkien & Lewis, about his relationship with his friend and fellow author C.S. Lewis. Both movies sound like they're focusing on different aspects of Tolkien's life, although I admit to loving the idea of a movie focusing on the two titans of fantasy literature, their friendship and their religion (Tolkien converted Lewis to Christianity, only to watch Lewis more or less become famous for it). Here's the problem, though: Attractive Films has hired director Simon West to make the Tolkien and Lewis flick, and his past movies include Con Air, Tomb Raider, and The Expendables 2. This doesn't really seem like his cup of tea. Hey, maybe The Hollywood Reporter got it wrong, and the title is actually Tolkien Vs. Lewis? Or maybe even Tolkien V. Lewis? That might make more sense.